Mandaluyong, officially the City of Mandaluyong, (Filipino: Lungsod ng Mandaluyong), or simply known as Mandaluyong City, is a 1st class highly urbanized city in Metro Manila, Philippines. According to the 2015 census, it has a population of 386,276 people. Located directly east of Manila., it is known for the Ortigas Center, a commercial and business center that is also shared with the city of Pasig. Notable institutions and establishments in the city include the Asian Development Bank, the headquarters of Banco De Oro and San Miguel Corporation and shopping malls like Shangri-La Plaza and SM Megamall. The city is bordered by Manila to the west, San Juan to the north, Quezon City to the northeast, Pasig to the east, and Makati to the south. 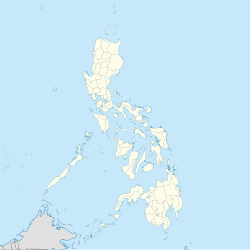 It is also the 6th-smallest city in the Philippines with a land area of 11.06 km2 (4.27 sq mi). There are different stories on the origin of the name Mandaluyong. One tells of how the place was abundant with a kind of tree called luyong, now more commonly known as anahaw (Saribus rotundifolius), from which canes and furniture were made. Another claims that the Spaniards named the place based on the report of a navigator named Acapulco, who saw the rolling hills frequently being lashed at by daluyong (“big waves from the sea”). This seems to confirm traditional pre-Hispanic stories that giant waves from the sea would meet the adjoining hills of the vast lowland, referred to as salpukan ng alon. Felix dela Huerta, a Franciscan historian, observed that the rolling topography of this land resembled giant waves of the sea. As with the etymological legends of many Philippine places, when the foreigners asked as to what the place was called, the locals answered with the description "madaluyong" ("undulating"), later transcribed by Spanish writers into "Mandaluyong" with the addition of an “n”. Romantic residents, however, peddle the similarly formulaic legend of a Maharlika named Luyong who fell in love with Manda, the lovely daughter of a barangay chieftain. The chieftain had no personal liking for Luyong and forbade him Manda's hand. Luyong overcame this objection by winning a series of tribal contests which was the custom at the time. The couple settled thereafter in a place which was later called “Mandaluyong" by means of joining their names. Residents of Mandaluyong have always been known for their industry. Men did the laundry to the amusement of non-residents until shortly after the war, while the women ironed the clothes. These industrious people trace their roots to Emperor Soledan (also known as “Anka Widyaya” of the Great Madjapahit Empire) and Empress Sasaban of the Kingdom of Sapa whose son Prince Balagtas ruled as sovereign of the kingdom in about the year 1300. More than a century later, in about the year 1470, it expanded and was called the “Kingdom of Namayan” with “Lakan Takhan” as sovereign. The vast Kingdom comprised what are now Quiapo, San Miguel, Sta, Mesa, Paco, Pandacan, Malate, Malate and Sta. Ana in Manila, and Mandaluyong, San Juan, Makati, Pasay, Pateros, Taguig, Parañaque, and portions of Pasig and Quezon City up to Diliman that were then part of Mandaluyong. Mandaluyong was first known as a barrio of Santa Ana de Sapa which was part of the District of Paco, Province of Tondo. Named San Felipe Neri by the Spaniards in honor of the Patron Saint of Rome, it was separated civilly from Santa Ana de Sapa in 1841. On September 15, 1863 San Felipe Neri established its own parish and under the administration of the Congregation “Dulcísimo Nombre de Jesús”, it constructed its own church, convent and school. The Parish of San Felipe Neri played a significant role as a relay station for propagating the Katipunan during the 1896-1898 Revolution. Mandaluyong shows significance in the historic Philippine Revolution of 1896 as the baluarte (territory) of Katipunan or "Makabuhay" group with seventeen (17) branches. On August 29, 1896, Andres Bonifacio, together with Emilio Jacinto and other members of the Katipunan went into the house of Romualdo Vicencio at Sitio Balakbak (now Villa San Miguel) to prepare for the upcoming revolution against Spanish authority. In this site, Bonifacio read the last manifestation of the Katipunan before they transferred in Hagdan Bato, in the house of Felix Sanchez. This event is also known as the "29 De Agosto" and "Pinagtipunan" in which it is already named in two streets near the historic Barangay Hagdan Bato Itaas. It was in Barangay Hagdang Bato on August 28, 1896 where Andres Bonifacion issued a proclamation setting Saturday, August 29, 1896 as the date of the attack on Manila. On August 30, 1896, after the successfully revolution in San Felipe Neri, the katipuneros went to San Juan del Monte and attacked the El Polvorin (gunpowder depot) in order to amass more weapons to use against the Spaniards. This event is popularly known as the Battle of San Juan del Monte. It was also in this town that the revolutionary paper, “La Republika”, was established on September 15, 1896. During the American Occupation, San Felipe Neri was raised to a first class municipality with five (5) barrios, namely: Poblacion, Barangka, Hagdang Bato, Namayan and Hulo. Under Presidential Act No. 942, it was consolidated with the municipality of San Juan del Monte and became the seat of government. For several months in 1904, San Felipe Neri became the capital of the province of Rizal. San Felipe Neri was separated from San Juan and became an independent municipality on March 27, 1907. It was renamed the Municipality of Mandaluyong by virtue of House Bill No. 3836 which was authored and sponsored by Assemblyman Pedro Magsalin, then the Representative of the District of Rizal. Many government infrastructures are established during the American Period including the Correctional Institute for Women, Welfareville Compound, The Boy's Town, and the National Center for Mental Health. During World War II, Mandaluyong lost many of her people; among them were Catholic priests and civilians. Destruction was felt all over, but with the timely arrival of the American Liberation Forces and the Philippine Commonwealth troops on February 9, 1945, the municipality was saved from further damages. That day became a red calendar day for Mandaluyong marking its liberation from the Japanese Imperial forces by the Allies. After World War II, Mandaluyong began to become progressive and dramatically increase the economy. Many infrastructures, companies, and other businesses were developed in 1950s-1960s and as the result, Mandaluyong recognized as the most developed municipality in the Province of Rizal. On November 7, 1975, Mandaluyong was formally included in newly established Metropolitan Manila by virtue of Presidential Decree No. 824 signed by President Ferdinand Marcos. By virture of the 1987 Constitution Mandaluyong and the then municipality of San Juan were represented in congress by a single Congressman. Rep. Ronaldo Zamora sponsored a House Bill which eventually became Republic Act № 7675 otherwise known as "An Act Converting the Municipality of Mandaluyong into a Highly Urbanized City to be known as the City of Mandaluyong." President Fidel V. Ramos signed R.A. No. 7675 into law on February 9, 1994 (the 49th anniversary of its liberation from the Japanese), which was ratified through a plebiscite on April 10, 1994 making Mandaluyong the 5th city in Metro Manila. Mandaluyong became a lone district with its own Representative in Congress. Prior to the enactment of the assailed statute, the municipalities of Mandaluyong and San Juan belonged to only one legislative district. Mandaluyong today is composed of 27 barangays divided into two political districts mainly by Boni Avenue and G. Aglipay Street. As of January 9, 2002, it has 1,238 voting precincts and a total of 166,037 registered voters. In 2003, Mandaluyong was recognized as "The Tiger City of the Philippines" because of dramatic improvement in the city's economy. According to Pedro Patricio in his book (Mandaluyong: 1837-1975), Mandaluyong had five original barrios (Poblacion, Barangka, Hagdang Bato, Namayan, & Hulo) as per the first recorded census in 1903. From these five evolved 22 sub-barrios which, like the original barrios, then became independent barangays. This place is located on the uplands where steps are carved in its rocky hills and used as stairways. However, this place is better known for its historical significance because of the role it played during the Spanish occupation. Mandaluyong lies on a heart-shaped 11.06 square kilometres (4.27 sq mi) of land, 7 kilometres (4.3 mi) southeast of Manila and 8 kilometres (5.0 mi) west of Pasig. To the south lies Makati, to the northwest, San Juan, and to the northeast, Quezon City. Thus Mandaluyong is located at the center of Metro Manila. Mandaluyong is politically subdivided into 27 barangays. Mandaluyong's climate is classified as tropical. In winter, there is much less rainfall in Mandaluyong than in summer. This climate is considered to be Aw according to the Köppen-Geiger climate classification. The temperature here averages 27.2 °C. In a year, the average rainfall is 2093 mm. Precipitation is the lowest in February, with an average of 8 mm. With an average of 448 mm, the most precipitation falls in August. At an average temperature of 29.2 °C, May is the hottest month of the year. January has the lowest average temperature of the year. It is 25.5 °C. Between the driest and wettest months, the difference in precipitation is 440 mm. During the year, the average temperatures vary by 3.7 °C. The city is home to a number of shopping centers, entertainment hubs, commercial establishments, high-rise offices, residential condominiums and hotels. The city is one of the important business and financial areas in the metropolis. The Mandaluyong City Skyline excluding Ortigas Center. Like other cities in Metro Manila, Mandaluyong has its own share of commercial strips and a central business district. The former commercial area, consisting mostly of banks, offices and service establishments, stretch along public transport routes thereby serving both local consumers and passers-by from the neighboring localities. Major commercial strips of the city include the stretch of Boni Avenue, Shaw Boulevard, Libertad-Sierra Madre area, Kalentong, San Francisco, part of Martinez, Sgt. Bumatay towards Barangka Drive and Pinatubo towards EDSA. Mandaluyong's central business district is concentrated on the EDSA-Shaw-Pioneer area. Industrial activities are mostly concentrated within the Shaw Boulevard-Pioneer area and along the Pasig River. Although prominent in the manufacture of foods, medicines and laboratory equipment, these industries are gradually declining in number, opting to relocate in newly developed industrial zones outside Metropolitan Manila. In the Pasig River area, particularly in Barangays Namayan and Mabini J. Rizal, areas formerly industrial are now the sites for residential subdivisions and townhouses. In the EDSA-Shaw-Pioneer area, the transformation is toward a more economically profitable and globally competitive commercial activity. And since December 2013, Mandaluyong is the home of one of the largest television networks in the country, The 5 Network (owned by TV5 Network located at the TV5 Media Center). Listed below are persons who have served as mayors of Mandaluyong. The city is provided with good access roads to and from adjacent cities in the metropolis. The city is served by one of Metro Manila's main roads such as the Epifanio de los Santos Avenue (EDSA), Ortigas Avenue and Shaw Boulevard. The city is 36 minutes away from the Ninoy Aquino International Airport. Mandaluyong is served by the Epifanio de los Santos Avenue, Metro Manila's main thoroughfare. Considered as the heart of the metropolis, main roads such as the Ortigas Avenue and Shaw Boulevard provide inter-city linkages, while Boni Avenue and Martinez Street (C-3 Road) serve as alternate routes in the city. Other major roads in Mandaluyong include Boni-Pioneer Underpass, a 280-meter long tunnel underneath EDSA (Epifanio de los Santos Avenue) connecting Boni Avenue on its western-end and Pioneer Street on the east. and Julia Vargas Avenue. Jeepneys are one of the most common modes of public transportation for commuters in the city. Aside from jeepneys, tricycles and pedicabs are also one of the important modes of public transportation in Mandaluyong, especially on alleys around the city. The presence of the Pasig River stretching along the south border of Mandaluyong provides an alternative route and mode of public transportation mainly for cargo freight of industries along the river, and for commuters seeking for a faster and more direct route to and from the cities of Pasig and Manila. The Pasig River Ferry Service has one station in the city. Mandaluyong has several private and public hospitals & health center, namely the privately owned Dr. Victor R. Potenciano Medical Center along EDSA and Unciano General Hospital, and the government hospital Mandaluyong City Medical Center. The city is also home to the National Center for Mental Health. Many residents, specifically the middle-to-upper class medical clientele, visit the nearby The Medical City in Ortigas Center. The Dr. Victor R. Potenciano Medical Center is a tertiary care hospital that has a 189-bed capacity within its 10-storey hospital building. In 2007, the Mandaluyong City government, together with non-governmental organization Rehabilitation and Empowerment of Adults and Children (REACH) Foundation, established a community-based rehabilitation program called Project Therapy, Education, and Assimilation of Children with Handicap (TEACH), that caters to children with special needs coming from indigent families. Services given by Project TEACH include free occupational therapy, physical therapy, speech therapy and special education classes. Four well-known educational institutions in the city are the Arellano University, Mandaluyong (Plaridel Campus), Don Bosco Technical College, Jose Rizal University and Rizal Technological University. A good number of city officials of Mandaluyong are alumni of Don Bosco, including incumbent Mayor, Benjamin Abalos, Jr. (HS '79); former Vice Mayor, Renato Sta. Maria (HS '65); City Councilors Edward Bartolome (HS '96), Noel Bernardo (HS '79), and Jonathan Abalos (HS '85). Other notable alumni include "King of Pinoy Rap," Francis Magalona (HS '81); and actor Ricky Davao (HS '78). Meanwhile, the alumni of JRU that includes President Ramon Magsaysay, Roderick Paulate, and Secretary Armand V. Fabella; Other colleges in the city include the Our Lady of Guadalupe Colleges (specializing in Medicine and Nursing), STI and AMA (both specializing in Computer Technology education, both located on Shaw Boulevard), NAMEI Polytechnic Institute (specializing in Marine Sciences), and the International Baptist College. The city is also home to Lourdes School of Mandaluyong (est. 1959), a Franciscan-Marian all-boys school, located in the Ortigas Center district managed by the OFM Capuchins; La Salle Green Hills (est. 1959), a private all-boys high school, managed by the De La Salle Brothers, located along Ortigas Avenue; and Saint Pedro Poveda College (est. 1960), another all-girls institution, offering pre-school, grade school, high school, and college education. Although the official school address is Quezon City, part of the lot Poveda's campus stands on is under Mandaluyong City. Mandaluyong High School (est. 1977) is the oldest public high school in the city. City of Mandaluyong Science High School (est. 1996), a public science high school on E. Pantaleon St. The city has 18 public schools, including primary and secondary schools as prioritize by the city government. The Mataas Na Paaralang Nepatli A. Gonzales is the largest school in Mandaluyong and the only school in the city which has the STEM highschool program. The Neptalians are also multi- awarded and has various great observations by the regional supervisors that captures their attentions. The official march of Mandaluyong is entitled "Martsa ng Mandaluyong" and was composed by then Councilor Delfin Asistio during the incumbency of then Mayor Benjamin Abalos. ^ Marcial C. Amaro Jr., ed. (January – April 2010). "Anahaw" (PDF). Some Familiar Philippine Palms that Produce High Food Value and Tikog. Ecosystems Research and Development Bureau of the Philippine Department of Environment and Natural Resources. Archived from the original (PDF) on 22 May 2013. Retrieved 1 April 2013. ^ " "Archived copy". Archived from the original on 9 August 2014. Retrieved 17 July 2014. CS1 maint: Archived copy as title (link)"
^ " "Archived copy" (PDF). Archived from the original (PDF) on 3 March 2016. Retrieved 23 February 2016. CS1 maint: Archived copy as title (link)"
^ "City of Mandaluyong : Introduction : Land Area". www.mandaluyong.gov.ph. City of Mandaluyong. Retrieved 28 December 2015. ^ "An Update on the Earthquake Hazards and Risk Assessment of Greater Metropolitan Manila Area" (PDF). Philippine Institute of Volcanology and Seismology. 14 November 2013. Archived from the original (PDF) on 24 June 2016. Retrieved 16 May 2016. ^ "Enhancing Risk Analysis Capacities for Flood, Tropical Cyclone Severe Wind and Earthquake for the Greater Metro Manila Area Component 5 – Earthquake Risk Analysis" (PDF). Philippine Institute of Volcanology and Seismology and Geoscience Australia. Retrieved 16 May 2016. ^ "City of Mandaluyong : Introduction : Table 1.01 Land Area Distribution". www.mandaluyong.gov.ph. City of Mandaluyong. Retrieved 28 December 2015. ^ "Final Results – 2007 Census of Population". Census.gov.ph. Archived from the original on 20 November 2008. Retrieved 17 October 2011. ^ "Total Population by Province, City, Municipality and Barangay: as of May 1, 2010" (PDF). 2010 Census of Population and Housing. Philippine Statistics Authority. Archived from the original (PDF) on 15 November 2012. Retrieved 30 November 2012. ^ "CLIMATE: MANDALUYONG, CLIMATE TABLE". Climate-Data.org. Retrieved 22 September 2015. ^ "Manila, Luzon Climate & Temperature". Climatemps.com. Retrieved 22 September 2015. 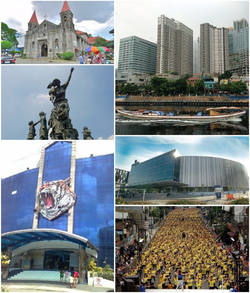 ^ "Mandaluyong City Profile". City Government of Mandaluyong. Retrieved 9 February 2014. ^ "Commercial Activities". City Government of Mandaluyong. Retrieved 9 February 2014. ^ "Industrial Activities". City Government of Mandaluyong. Retrieved 9 February 2014. ^ a b c "Transportation". City Government of Mandaluyong. Retrieved 10 February 2014. ^ "New bridge connecting Makati, Mandaluyong opened". GMA Network News. Retrieved 27 June 2015. ^ Yee, Jovic (17 May 2015). "Free school, therapy for poor kids with special needs wins UN award". Philippine Daily Inquirer. Retrieved 24 May 2015. ^ "City of Mandaluyong : News Updates". Mandaluyong.gov.ph. 3 January 2011. Retrieved 17 October 2011. ^ "Don Bosco High School". Bosco.arttickles.com. Retrieved 17 October 2011. ^ "Mandaluyong City Council : Edward Gabriel Bartolome". Mandaluyong.gov.ph. 4 November 1979. Retrieved 17 October 2011. ^ "Mandaluyong City Council". Mandaluyong.gov.ph. Retrieved 17 October 2011. ^ "www.donboscoforum.com". donboscoforum.com. Retrieved 17 October 2011. ^ "Francis Magalona Succumbs to Cancer | A Filipina Mom Blogger". Aboutmyrecovery.com. Archived from the original on 7 July 2012. Retrieved 17 October 2011. ^ "Don Bosco Mandaluyong Batch 72 Photo Gallery by Jojo Vicencio – DU1VHY at". Pbase.com. Retrieved 17 October 2011. Wikimedia Commons has media related to Mandaluyong City. Wikivoyage has a travel guide for Mandaluyong.